This article will look at the multitude of possible damage and violations in the field. Jointly-shared utility poles have many working parts that keep operations in motion for power, telephone, broadband, and television services. Over time the cost of damage adds up. Watch the video below to see damage and violations up close. During our pole inventory experience, we have found several types of damage and violations. Damaged cross arms or attachments are common and should be remedied right away, as they can lead to bigger problems. If cross arms or attachments are so damaged that they fall, they can be a huge liability to the asset owner and to public safety. Damaged hardware should be replaced as soon as possible. The hardware may be so faulty that the cross arms, cables, and anchors cannot stay attached. Further, damaged hardware is a liability for asset owners as it poses dangerous threats to maintenance teams. If pole anchors are damaged, the entire pole can be at risk for falling, which is a major risk owners must keep under control. Check out a recent article from our blog on anchor safety here. 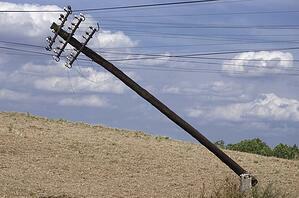 Damaged wood, rot, decay, or cracks and splits, all dramatically affect pole conditions. The only way to know the status of utility poles conditions – including cross arms, hardware, anchors, and so on – is through a thorough inventory of the pole. Inspections keep poles safe, accessible, in operating condition, and help to encourage strong joint use partnerships. Inspections should always check pole height, number, condition, and clearance from the ground of the lowest attachment and report any pole damage and violations. This may include attachments damage, hardware or cross arm damage, collision damage, and internal pole damage. Inspection teams need a daily progress overview for any given project. Owners can choose to employ a centralized asset management system as a hub of communication between themselves, inspection teams, and attaching companies. Accurate inventory records are key to making the best use of inventory data in order to take action. Streamlining communication, and the ability to easily share important inventory documents with partners is integral in maintaining accurate records as conditions continue to change in the field. For example, dashboards that help organize inventory data allow joint use teams to create transparency. They alert users of all types of requests, such as pole transfers, permits to attach, miscellaneous requests, or pole removals. Project teams can see in real-time the status of any in-progress inventory. Users can be notified when violations or damage are found, as well as the action that should be taken. What information would you like to see in a dashboard during a damage and violations inventory? Let us know in the comments below.